ENGLISH: "La Resistencia", the second release by Yasser Ramos, is coming to digital retailers on August 16th! Below is a teaser of the track "A Mi Que No Me Den De Esa Cosa" featuring Alexander Abreu. The album contains 13 tracks plus the bonus track "Songo Cerra'o", which Yasser recorded with Mandy Cantero and has been a hit for months now. ESPAÑOL: "La Resistencia", el segundo disco de Yasser Ramos, llegará a los minoristas digitales el 16 de agosto. A continuación hay un adelanto de la canción "A Mi Que No me Den De Esa Cosa" con Alexander Abreu. El álbum contiene 13 pistas más la canción extra "Songo Cerra'o", que Yasser grabó con Mandy Cantero y ha sido un éxito durante meses. ENGLISH: "La Resistencia" was 6 months in the making and is being released on the Warachando Records Inc label, which was recently started by DJ Warapo, who also has his own production company - Warapo Productions. Starting today "La Resistencia" is available for pre-order at iTunes. Andriod and Google users can pre-order at Google Play. Stay tuned for more info and links to buy the album. ESPAÑOL: "La Resistencia" llevaba 6 meses de trabajo y se estrenará bajo el sello Warachando Records Inc, que recientemente fundó DJ Warapo, que también tiene su propia companía de producción, Warapo Productions. Empezando hoy "La Resistencia" está disponible para preordenar en iTunes. Usarios de Android y Google Play lo pueden preordiner en Google Play. Estén atentos para más información y enlaces para comprar el álbum. 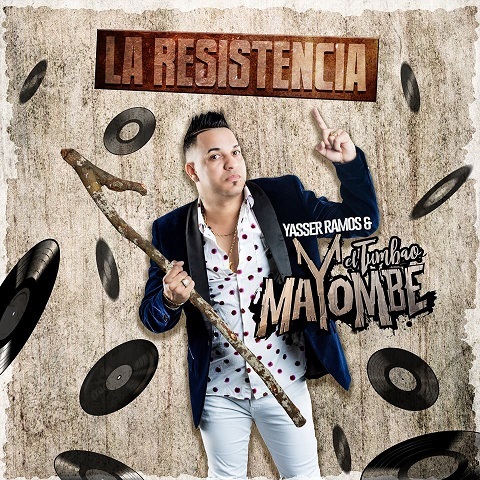 You have been DJing for 8 years with your base in Los Angeles and have also produced concerts with your company Warapo Productions and now you have founded Warachando Records and are about to release “La Resistencia” by Yasser Ramos y El Tumbao Mayombe. Has this been a straight path? What brought you to the point of starting your own record company? “Before I answer that, Michelle, I want to thank you for this interview. I also want to thank http://timba.com for the exposure its platform gives to Cuban music. To answer your question, the path has been a straight one for me. My parents are Cuban and since my birth, they have exposed me to our Cuban roots. My father passed down the knowledge and nurtured the love that I have for Cuban music. The musical gifts that my father bestowed on me were fundamental to my in-depth understanding, appreciation, and respect for Cuban music. This “schooling” has been critical to my success as a DJ. By the time I was 18, I began to DJ at local venues. I established my residency in Los Angeles with weekly events spinning Cuban music. As my reputation grew, I was invited to open for bands like Los Van Van, Charanga Habanera, Havana D' Primera, and Orquesta Aragon to name a few. These opportunities inspired me to create my own events to promote Cuban Music in LA and the US. Under my production company, Warapo Productions, I produced a series of concerts and a national tour. Maykel Blanco y Su Salsa Mayor played for the first time in LA in 2011. Based on the success of this concert, I seized the opportunity to manage Maykel Blanco’s US tour in 2016, which was a great success. The following year in 2017, Habana D’ Primera came to LA. All of these endeavors showcased my dedication, passion and ability to successfully produce and promote Cuban-related events. And let me note that this is not an easy task, especially in a Puerto Rican salsa dominated US market and with political complications such as the Cuban Embargo Act. After the success of the US tour, Maykel Blanco invited me to DJ at his 3rd annual “Festival De La Salsa.” This is a great honor for any DJ in or out of Cuba. It was at the festival this past February that the idea of my own record company came about. My mentor and dear friend, DJ Melao, and I spoke with Yasser Ramos about his exciting musical projects. We offered our support to promote his music. This conversation sparked the idea to expanding my business to include a record label. The goal of Warachando Records is to sign artists with fair negotiations that benefit the record label as much as the artist. A critical context for this decision is based on many Cuban artists historically and currently stilling signing lopsided contracts that exploit them. Cuban music and artists can only continue to grow and thrive if we compensate them fairly and provide them artistic freedom. With all that said, after hundreds of hours of consideration and research Warachando Records was born! I know these are early days for Warachando Records, but what plans do you have after the release and distribution of “La Resistencia”? I plan to give the album as much promotion and significance as possible. I firmly believe that for the past couple of years there has been very poor promotion behind Cuban music albums in the “Timba” scene. In other words, records just come out of nowhere, and nobody finds out about it. Also, as of late the availability of an album is terrible; sometimes you can’t even find it in your favorite digital platform which I think is unacceptable. The plan of distribution for this album is solid; we are going to have it available on over 30 digital platforms alongside a physical copy which will be available soon after the digital release. Also, the promotion has been robust, and I believe there has been anticipation and support from DJ’s and Cuban music followers around the world. Our plan after this release is to do our European tour which we have programmed for January 2019. Our team is very confident that this project will open doors to many tours in the future. What can you tell us about Yasser’s new CD? Yasser’s album promises a lot; I believe it is a very balanced album from start to end. He defends the musical style Songo invented by the legendary composer/arranger Juan Formell creator of Los Van Van. “La Resistencia” consists of 13 songs and 1 bonus track which are all upbeat and has its unique style but always maintaining the authenticity of “Songo.”The talented Nachito Herrera Jr. had the most significant responsibility in what is musical arrangements in this album alongside Yulien Eire, and Raydel Garcia who contributed with their arrangements. The pre-order of “La Resistencia” is now availalble at iTunes. The album will be available August 16th in over 30 digital platforms including the main ones, iTunes, Spotify, Amazon, Google Music, etc. I hope all the followers of timba.com will support this album as it is vital for all Cuban music lovers to support these albums monetarily. 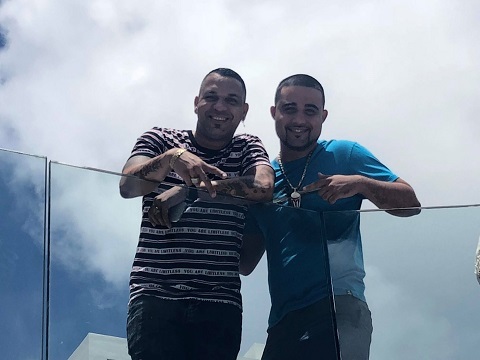 We are living in a tough era where it is no secret that reggaeton has invaded and taken over the Latin market. I firmly believe that supporting projects like these helps prove that this music can sell and compete with any genre or movement by showing the support.